Victory Miniatures wanted something different from their normal range of models and sculptor Paul Phillips certainly came up with the goods in this model. 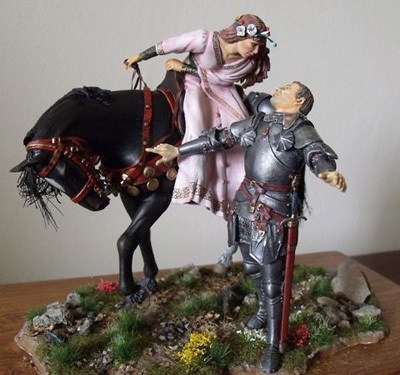 Based on the French painting "La Belle Dame Sans Merci" it makes up into a truly impressive model. The resin and white metal parts are beautifully cast and full instructions with thumbnail pictures to help assembly are included. A good sized base to mount the model on is also included in the kit.